North County Orthopedic Medical Group is San Diego, California’s foremost authority in orthopedic care. Dr. Sidney Levine provides prompt evaluation and exceptional treatment for orthopedic injuries and conditions. He has been leading the way in work-related injuries and longshore-related problems for more than 30 years. Dr. Levine employs state-of-the-art treatments to ensure that you experience the best recovery possible. Dr. Levine has experience with legal proceedings for injuries in California and will work with your attorney as necessary. 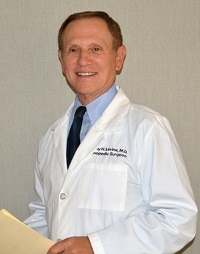 Dr. Sidney Levine is a leading board-certified general orthopedic surgeon in the San Diego, CA area. He does general orthopedic care, work-injury evaluations, and more. At North County Orthopedic Medical Group, you can receive treatment for a variety of orthopedic conditions with cutting-edge procedures. Our minimally invasive outpatient procedures and non-surgical treatment options are designed to get you back to work or play as quickly as possible. We have X-ray capabilities on site to start your treatment sooner. Many of our staff are bilingual, and language interpreter services can be arranged as needed. Schedule an appointment with our orthopedic specialist, Dr. Sidney Levine by calling (858) 457-4040 or you can request an appointment online. We look forward to seeing you in San Diego at North County Orthopedic Group.